I am not a beautiful and unique snowflake. I don’t get a thrill out of seeking out the unknown and unpopular. For the most part, I am a mass-market consumer with a few odd customisations. I loves me the RPGs… but I’m a solitary gamer. I don’t talk about myself. I don’t bring games up in conversation. I don’t need or want other people to play with me. All I want is to be left in peace to explore strange new worlds, seeking out new life and new civilizations. So, if you want to really understand me, you’ll have to play an RPG. 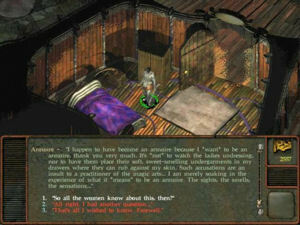 Planescape: Torment, the greatest RPG ever created. I mean it. What’s not to love? It has a wise-cracking floating skull. It has a useful journal system. It has the novelty of progression through NOT killing things. But most of all, it has meaning and depth and emotion. Play it for the consequences of immortality, both glorious and tragic. Play it for the odd philosophy of belief and how it shapes the world. Play it to meet a cast of characters as yet unrivalled in the games industry. Hell, play it just to meet Annah, the hot be-tailed tiefling. She’s awesome and takes no crap from anyone. Play it, and you’ll see a huge part of my childhood. This game has everything I love about fantasy. Blog Banter is a group of bloggers passionate about anything and everything video games. We enjoy getting together once a month to write about the same subject. You will be amazed at the different viewpoints so many people can have on the exact same topic! If you are interested in participating, contact bs angel for more information. Enjoy all of our articles. This brings back memories of Icewind Dale, Diablo II, Baldur’s Gate. Man di I spend hours in these games! This was the time when story was as, if not more, important as the visual. The good old days of RPG. If you have an Xbox 360, there is a great one called Arkadian Warriors. Its also online co-op as well. I love that game. I don’t play that genre at all so I found your article particularly interesting. If I was going to venture into RPGs though, this sounds like a great one to play. I loved your description “Play it for the consequences of immortality, both glorious and tragic.” That makes it sound absolutely epic. Pingback: Blog Banter 3: Get To Know Me! Interesting, I used to enjoy those kind of single player RPG adventures when I was growing up, however for me I need to have the multiplayer aspect to my RPG these days. The only exception in recent years has been Star Wars: Knights of the Old Republic which was one of the best games I’ve ever played, plus the story itself was better than movies Episodes 1-3! Interesting…I haven’t really played much RPG, but they do interest me. Still stuck on Halo 3 and COD4. I will have to check it out. Pingback: Blog Banter February: What game should we play to get to know you? Yay for RPG love. I hate to say that I missed Planescape. I wasn’t impressed with Baldur’s Gate, but it looks like I should have stuck with them. CrazyKinux: Yeah, I love the Black Isle Studio games :) Japanese RPGs don’t really do it for me and Oblivion was fun but ultimately disappointing. Can’t wait for Fallout 3 but it’s still years off! Silvercube: Hey yeah, I played the demo of that. Surprisingly entertaining for a Live Arcade RPG. I’ll add you to my Xbox Live friends next time I’m online. bs angel: Yeah, it was epic :) Storytelling was absolutely crucial to the game. bsb boffman: Again, Mass Effect is a good place to start, especially if you’re more into space and guns than traditional orcs and elves fantasy. If you don’t mind bows and magic then Morrowind is a good cheap PC option. Terry: Baldur’s Gate 2 was a huuuuuge improvement over BG1. NeverWinter Nights 2 isn’t bad I guess – I sort of went off it because the start was so similar to NWN1 but it seems to be a decent by-the-numbers fantasy RPG. I’ve not tried Mass Effect yet – it does sound like a great game to play and one that I’d like – however I have a self-imposed ban on getting new games till I’ve got through my current backlog! Sounds good – sign me up! As for games I’d suggest, not quite sure on that… But I reckon I’d have the original Street Fighter 2 in there, along with Final Fight, Project Gotham Racing 2, Mass Effect, Neverwinter Nights and many more.